A new, nine-day culinary adventure, Thailand – Flavors and Culture of Exotic Siam is the newest addition to Access Trips portfolio for this fall. Guests on this journey will experience the depth of Thai culture from Bangkok to Chiang Mai and beyond. From a morning visit to Wat Po, where monks gather for an awe-inspiring morning chant, to an elephant ride through the Thai jungle, the captivating cultural highlights delight the senses. Master the art of preparing your favorite Thai specialties during intimate cooking courses featuring everything from phad thai and curries to spring rolls and hot and sour soup. No detail has been spared in crafting a tour that masterfully captures the diverse landscape, distinct customs and rich flavors of the “Land of the Free”. Access Trips is a leading travel company specializing in exotic and edgy learning vacations to 13 countries worldwide. Always offering unparalleled access to each destination, this new Thai culinary adventure features the perfect balance of “must sees” and magical secret spots. Providing a full Thai immersion, Access Trips’ will offer the brand new culinary expedition, Thailand – Flavors and Culture of Exotic Siam for the first time in November of 2012. 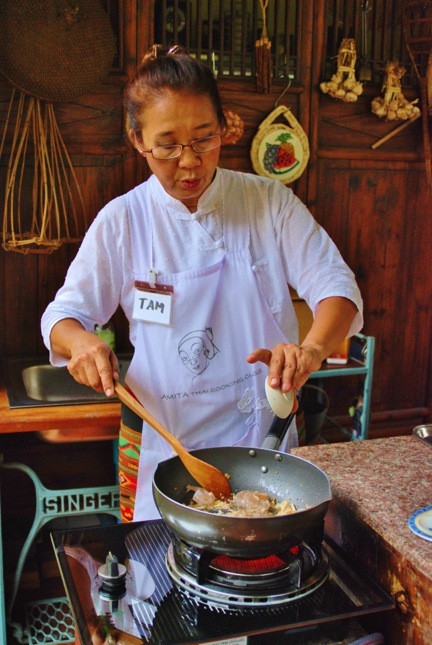 • Home-Style Cooking Courses – From tangy salads, to rich, hearty soups and delectable curries, enjoy three extended cooking classes featuring some of Thailand’s most exotically spicy and delicious meals. Savor a traditional long-tail boat ride up the Chao Phraya River to Chef Tam’s home for your first cooking course in Bangkok. After a tour of the herb gardens, head to an open air kitchen overlooking the breathtaking landscape where you will learn to prepare Phad Thai, coconut chicken soup, coconut pancakes and sumptuous wok fried ground chicken with basil. With two additional cooking courses in Chiang Mai, you will master the art behind everything from Thai-style banana fritters to steamed fish with curry custard. • Morning Visit to Wat Po – During an excursion to one of Bangkok’s oldest temples, witness the magnificent hum of the monks early morning chant. View the famous reclining Buddha before heading to the Grand Palace in an open air taxi. • Private Dinner in Bangkok’s Chinatown – Venture through the bustling Bangkok marketplace to an unmarked door where culinary dreams come true. Pass through the door into an old Chinese shop house, where a private dining room with one circular banquet table awaits guests. Enjoy a multi-course banquet dinner prepared by Chef Jok using only the freshest ingredients of the day. • Explore the Golden Triangle – Witness the infamous Golden Triangle, renowned for centuries as the center of the opium trade. From a hilltop view, marvel at the splendor of the mighty Mekong joining with the Ruak to form the actual “triangle” where Laos, Myanmar and Thailand meet. • Elephant Ride through the Jungle – On the way to Chiang Mai stop by an elephant camp to witness the elephants take their morning bath in the river. Climb aboard an elephant for an hour-long trek along the Ping river through the lush jungle. • Chiang Mai’s Most Mesmerizing Sites – Discover the principal religious center in northern Thailand during a trip to Wat Prathat, Chiang Mai’s most important and visible landmark. Built some 600 years ago, this iconic site is located near the summit of Doi Suthep, at 3,250 above sea level. Climb the magnificent 306-step Naga (dragon-headed serpent) staircase and reward yourself with a superb panoramic view of the city. • Boutique Accommodations – Enjoy boutique luxury accommodations that blend the best of Thai style and hospitality to create a peaceful respite from your busy days. From a five-star riverfront hotel featuring views of the legendary “River of Kings” to a small hotel inspired by the traditional wooden architecture of Chiang Mai, all accommodations feature comfortable and stylish rooms. Rates start at $3,490 per person and include accommodations, most meals, ground transportation in a deluxe van, airport transfers and domestic airfare. International airfare is not included. Groups are limited to 12 travelers, who are accompanied by a multilingual local guide. For more information please visit www.accesstrips.com or call (650) 492-4778. Access Trips is the leading adventure tour operator specializing in exotic learning vacations to 13 countries worldwide. This company offers a wide range of small-group outdoor sports and culinary-focused trips that are expertly designed to allow guests to experience a new culture, learn new skills or fine-tune existing ones, and revel in the splendor of their destination. Based in San Francisco, California and launched in 2001, Access Trips’ portfolio includes cooking, surfing, mountain biking, snowboarding, skiing, and multisport itineraries. Regardless of the focus of the activity, Access Trips caters to a variety of skill levels, serving the novice as well as the expert in a relaxed, non-intimidating setting with the help of world-class instructors and multilingual guides. For more information about Access Trips and the tours available, visit www.accesstrips.com. Access Trips’ will offer the brand new, nine-day culinary expedition, Thailand – Flavors and Culture of Exotic Siam for the first time in November of 2012. Guests on this journey will experience the depth of Thai culture from Bangkok to Chiang Mai and beyond. Access Trips is a leading travel company specializing in exotic and edgy learning vacations to 13 countries worldwide. This new Thai culinary adventure features the perfect balance of “must sees” and magical secret spots. Access Trips is a leading adventure tour operator specializing in exotic learning vacations to 13 countries worldwide. This company offers a wide range of small-group outdoor sports and culinary-focused trips that are expertly designed to allow guests to experience a new culture, learn new skills or fine-tune existing ones, and revel in the splendor of their destination. Based in San Francisco, California and launched in 2001, Access Trips’ portfolio includes cooking, surfing, mountain biking, snowboarding, skiing, and multisport itineraries. Regardless of the focus of the activity, Access Trips caters to a variety of skill levels, serving the novice as well as the expert in a relaxed, non-intimidating setting with the help of world-class instructors and multilingual guides. For more information about Access Trips and the tours available, visit www.accesstrips.com.